Privacy and seclusion on your own slice of the Salmon River tucked away near the Resort at the Mountain in Welches, Oregon. The original cabin was built in the 1940's and since has been updated with modern kitchen and baths plus wood floors and a mountain feel throughout. The master bedroom boasts it's own balcony deck to view the woods and river. The cabin has three bedrooms and two baths. A handy wood shed is close to the covered porch to keep your wood stove crackling through winter. All you need is a hot tub and you are set for the perfect weekend getaway or vacation rental. Super convenient location close to amenities like the Resorts 27 hole golf course and restaurants yet a feeling of total privacy. A short drive away is the Mt. Hood National Forest for premium hiking trails and mountain bikers can head over to Sandy Ridge for the challenging trails to test their skills. Only 20 minutes to world class ski areas in Government Camp. 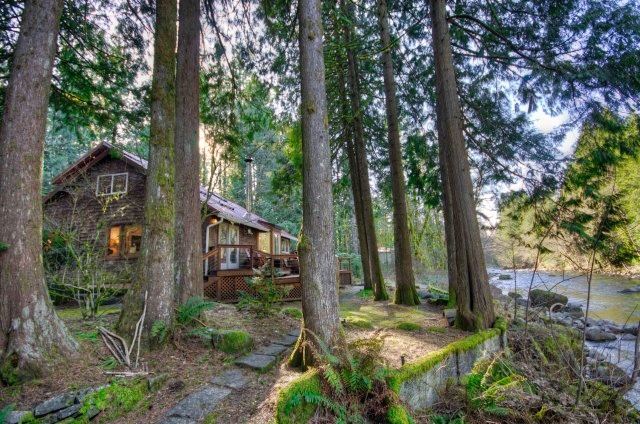 Salmon River Cabin Just Listed! New on the market this month is a newly painted getaway-Salmon River Cabin- with two bedrooms and lots of charm. A brand new front deck is a great addition! Sit on your deck and watch the ducks float by or read a good book at your own piece of Mt. Hood paradise. Summer adventures await you in this great location. Get your inner tub out and float down to the Resort. Hike up the Salmon River just up the street to hundreds of trails in the Mt. Hood National Forest. Bring your skis for year round skiing on the Palmer Glacier. Don't forget your mountain bike for the Sandy Ridge Mountain Biking Trail.